What is a SCART Lead ? What is a SCART Lead - and what does it do? 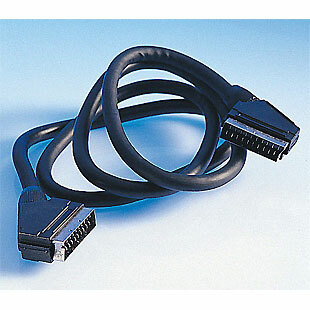 SCART (from Syndicat des Constructeurs d'Appareils Radiorécepteurs et Téléviseurs) is a French-originated standard and associated 21-pin connector for connecting audio-visual equipment together. It is also known as Péritel (especially in France, where the SCART word is not normally used) and Euroconnector. The SCART connector first appeared on television sets in 1977, and became compulsory on all new television sets sold in France starting from January 1980. Before SCART came, consumer TV sets did not offer a standardized way of inputting signals other than RF antenna ones, and even antenna connectors differed between countries. Assuming other connectors even existed, devices made by different companies could have different and incompatible standards. For example, a VHS VCR could output a composite video signal through a German-originated DIN-style connector, an American-originated RCA connector, or a BNC connector. SCART attempts to make connecting video devices together much simpler, by providing one plug that contains all the necessary signals (refer to the Pinout to the right for details), and is standard across different manufacturers. SCART makes connecting such devices very simple, because one cable can connect any two SCART-compatible devices, and the connector is designed so that you cannot insert it incorrectly. Devices with multiple SCART connectors can pass the signals unchanged when not active, which allows daisy chaining of multiple signal sources into a single TV socket. The voltage levels are quite high, around 1V, so the signals have good noise immunity. SCART is bi-directional regarding standard composite video and analog audio. A television set will typically send the antenna audio and video signals to the SCART sockets all the time and watch for returned signals, to display and reproduce them instead. This allows "transparent" set-top boxes, without any tuner, which just "hook" and pre-process the television signals. This feature is used for analog Pay TV like Canal Plus and was in the past used for decoding teletext. A VCR will typically have 2 SCART sockets, one connecting to the television set, and another one for the set-top box. When idle or powered off, the VCR will forward the signals from the television set to the set-top decoder and send the processed result back to the television set. When a scrambled show is recorded, the VCR will drive the set-top box from its own tuner and send the unscrambled signals to the television set for viewing or simple recording control purposes. Alternatively, the VCR could use the signals from the television set, in which case it would be inadvisable to change channels on the television set during the recording. SCART also enables a device to command the television set to very quickly switch between signals, in order to create overlays in the image. In order to implement captioning or subtitles, a SCART set-top box does not have to process and send back a complete new video signal, which would require full decoding and re-encoding of the color information, a signal-degrading and costly process, especially given the presence of different standards in Europe. The box can instead ask the television set to stop displaying the normal signal and display a signal it generates internally for selected image areas, with pixel-level granularity. This can be driven by the use of a "transparent" color in a teletext page. SCART allows a connected device to power on and power off a television set, more precisely: to bring it in and out of standby mode, in the same way as a remote control would do. A VCR will optimally power on when a cassette is inserted, power on the television set (or switch it to video mode) and then start playing immediately if the cassette's write protection tab is absent. When turned off, the VCR will ask the television set to power off as well, which the set will do if it was powered on by the VCR's request and if it remained in video mode all along.